Israel’s Prime Minister Benjamin Netanyahu has sent condolences to the family of 3-month-old Chaya Zissel Braun murdered in a terrorist attack in Jerusalem and met the policeman who killed the perpetrator. At Israel’s police headquarters in Jerusalem, Netanyahu was briefed on the incident and on the disturbances that have occurred in Jerusalem in recent months. He directed that sovereignty be asserted in all parts of the city via the stationing of additional forces throughout the city. Israel’s presiden Reuven Rivlin added: “The atrocious murder of an innocent baby girl, a victim of indiscriminate terrorism, should disgust all those who have a heart. The increasing incitement on the Arab streets and the streets of Jerusalem, which unfortunately receives the backing of leaders in the Arab world, has the ability to destroy the delicate balance of life in Jerusalem, and carry us all into a maelstrom of destruction and pain. As a sovereign people in our own country, and capital city, it is the security forces alone, who have the responsibility to act, decisively and unashamedly, in the face of these brutal terrorist operations. In what Israel terms a “run-over” terrorist attack, a Palestinian deliberately rammed his car into a crowd of Israelis near a light-rail train station in Jerusalem on Wednesday evening. 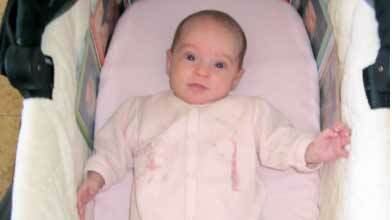 Then baby girl flew at least ten meters from her stroller after being struck by the car. Critically injured in the attack, she died of her head wounds an hour later in the nearby Mount Scopus Hadassah Hospital. Eight others were wounded, including two who are in critical condition and the baby’s father. The victims had just disembarked from a light-rail train at the station near the Ammunition Hill memorial and were on the pavement when hit. The attacker, identified as Abdel Rahman Al-Shaludi, a Palestinian resident of the eastern Jerusalem neighborhood of Silwan, who had served a prison sentence for Hamas terrorist activities, was shot by police as he fled the scene and died in hospital. A Hamas spokesman reportedly openly welcomed news of the terror attack in Jerusalem by one of its terrorists: “This is a natural response to the crimes of the occupation and invasion of our land by the Jews, particularly on the Al-Aqsa Mosque,” Hamas spokesman Hossam Badran stated on official Hamas television. Hamas television has also confirmed the identity of the terrorist. Numerous terrorist attacks using private cars and other vehicles have been carried out in Jerusalem in the past. The last attack occurred in August when a Palestinian used a digger to overturn a bus, killing a father of five and injuring five others. In addition, the light-rail has come under frequent attack from Molotov cocktails and rocks in the eastern neighborhoods of Jerusalem in recent months, damaging up to 40% of the trains. The horrible murder of a little baby, who fell victim to murderous indiscriminate terror is bound to shock anyone with a human heart. The increasing incitement on the Arab street and around Jerusalem, which is unfortunately backed by the leadership in the Arab world, can wreak havoc on the delicate fabric of life in Jerusalem, and drag us all into a maelstrom of destruction and pain. As befitting a sovereign people in its own country and in its own capital, it is the security forces and them alone, who have the full responsibility to act decisively and without cowardice in face of the perpetrators of brutal terrorist attack. In these trying times, our hearts are with the bereaved family and we pray for a quick and complete recovery of the wounded. הרצח הנורא של תינוקת רכה, שנפלה קורבן לטרור רצחני וחסר הבחנה, מחריד כל מי שלב אדם בו. ההסתה הגוברת והולכת ברחוב הערבי וברחבי ירושלים, הזוכה לדאבוננו לגיבוי מצד ההנהגה בעולם הערבי, יכולה להמיט אסון על מרקם החיים העדין בירושלים, ולסחוף את כולנו אל מערבולת של חורבן וכאב. כעם ריבוני בארצו ובבירתו, על כוחות הביטחון ורק עליהם, מוטלת מלוא האחריות לפעול בנחישות וללא מורך לב נוכח מבצעי טרור אכזרי זה. בעת הקשה הזאת, ליבנו עם המשפחה האבלה, ונתפלל להחלמה מהירה ושלמה של הפצועים.